Kuchmaner Chiropractic is a cheerful, inviting place where our team of warm and friendly staff is ready to help you. If you’d like, you can find the necessary paperwork online, download it and bring it to the office completed. Otherwise, you’re welcome to fill out these forms when you arrive. 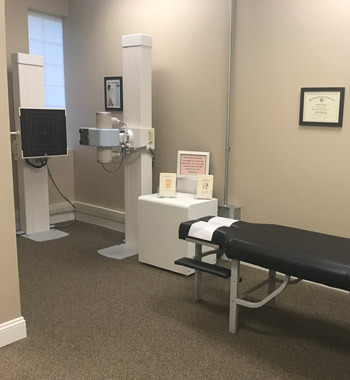 You’ll sit down with Dr. Kuchmaner for a consultation to discuss your health history, current conditions, how they may have happened and what may have caused them. If we feel that we can help you, we’ll begin a thorough examination that includes physical testing and X-rays, which can be taken on-site. When appropriate, we’ll complete a relief treatment. This appointment takes about 45 minutes. When you return, we’ll review your X-rays and Dr. Kuchmaner’s findings. Together, you’ll discuss the cause of your problem and how to correct it, which is our ultimate goal. We work with what your desired objectives are, ensuring a treatment plan is tailored to your needs. This appointment is shorter, taking just 15-30 minutes. Rest assured that your time is respected and each appointment is kept efficient. You’ll go to the adjusting room to have a chiropractic adjustment and meridian therapy or intersegmental traction as appropriate. Do I Have to Keep Going Once I Start Chiropractic Care? Once you understand what chiropractic does — removes interference from the nervous system, which controls every function of the body — you’ll grasp that regular chiropractic visits are a vital part of your health care. You can choose to come back periodically to reap the many benefits of chiropractic care. It’s part of a healthy routine, much like brushing your teeth regularly or working out at the gym on a regular basis. Insurance coverage can be used for your visits, including Medicare. Book your time with us today — we have extended hours available for your convenience!